This bread, with its mellow tang, is perfect for those who like their sourdough bread noticeably sour, but not mouth-puckeringly so. 23 hrs 45 mins. to 23 hrs 50 mins. 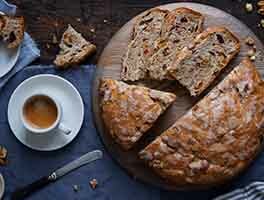 Looking for a more sour/tangier loaf? Try adding 1/2 teaspoon to 5/8 teaspoon sour salt (citric acid) to the dough along with the regular salt. 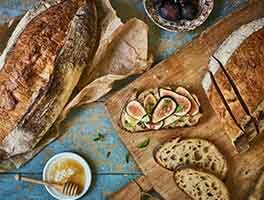 For a tasty loaf using commercial yeast (for faster rising), check out our recipe for Rustic Sourdough Bread. 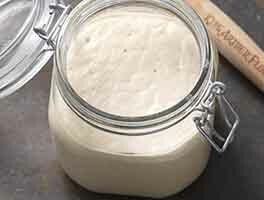 What makes the sour in sourdough bread? It's a combination of lactic and acetic acids, created as the dough rises and ferments. Refrigerating the dough encourages the production of more acetic than lactic acid; and acetic acid is much the tangier of the two. Thus, sourdough bread that's refrigerated before baking will have a more assertive sour flavor. 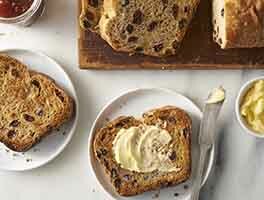 To serve as pictured above, split a loaf around the perimeter, and layer one half with oil-packed sun-dried tomatoes (or oven-roasted cherry tomatoes) and fresh basil leaves. Do I need to adjust the recipe if the bought the wrong flour? I purchased KAF Bread Flour with 12.7% protein. I did try this but the dough was dense and never got fluffy. I ended up rolling it out and making bread knots. The flavor was good but I want to make tangy sourdough bread. Don't worry Amanda, we've all been there! The dough had just over-proofed so it didn't have any gluten strength left to hold its rise. We recommend checking out our blog article "Over-proofed dough" by entering the title into the search bar above. There are some really helpful visuals, tips, and tricks in it to help know exactly when the dough is ready. I've made this recipe several times before but my results were only so-so. This time I read thru all of the reviews and noticed that some successes were based on very closely following the instructions. I admit I tend to >>not<< closely follow them. So, this time I changed things up and really did not deviate. Amazing how that works. My results were so beautiful. So, in the past, I moved thru the steps too quickly. I just didn't have the patience to get to the outcome that the pictures on the blog so clearly show. I re-learned that lesson from 3rd grade: follow instructions as written all the way to the end. The result is fantastic. Used cast iron dutch oven - came out beautifully - and more light than chewy. 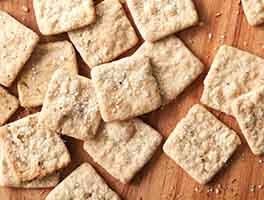 Am wondering how using bread flour would change the baking and texture/crumb/flavor. 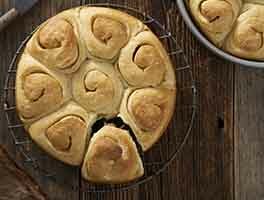 Can you use King Author bread flour for this recipe? Or does the recipe perform better with all purpose King Author flour. This recipe really gets you the tang you expect to get from a sourdough. It truly makes great loaves and is quite forgiving if you forget to do the folds while proofing. It would be great if you could help me understand the hydration percent (%) of it ,since i do not know how the starter counts (towards water or flour %? ). water is 340g and flour 602g so that is 56% hydration, but what about the starter and the total % it leads to ? I'm back for more feedback, actually (review: great recipe.) Once I started weighing the flour the dough got wetter. I had been baking this bread successfully for months before I wanted to go for bigger holes in the crumb (is that correct usage?) Bought the scale and weighed the flour and it was improved but once I started weighing the flour AND starter AND water, the dough got even wetter and when it was baked and sliced, looked exactly like biscotti. The HOLES were bigger, the taste was spectacular, but the rise? Also, it's so wet that after rising, I can't weigh out my loaves because.... well, I won't waste space explaining that. Suffice it to say that I'm barely able to shape them (twice) and they don't rise on the baking tray before oven time -- they spread. So, here's the facts involved: Flour: I use King Arthur Bread flour Oven PreHeat: solid half hour -- way past the 'beep, it's ready' beep Starter: 1/2 C King Arthur AP flour to 1/4 C filtered water, fed 4 hours previous to using (at it's peak) Baked loaves until 208F Will a proofing basket (on order) prevent the spread? I can always just go back to making it the way I did before, via volume, but I guess I'm disappointed it's not working for me the 'artisan' way. This is my second time baking this recipe and I love it. I may be exposing my naivete but is it ok to split each batch into 4 instead of two? Will baking be the same? I usually bake by eye anyway. Thanks! I made this recipe today but began it yesterday. It is amazing, forgiving and delicious!! I have large, gorgeous holes in it and great sour flavor. I haven't baked bread in over a year but this is such a great recipe that it seemed to accommodate my clumsiness and lack of experience. My starter came from a friend and I've fed it but never expected my first attempt at a Free form bread to come out like this. Thank you for a great recipe! Baked this today, and it turned out great in my dutch oven! Perfectly tangy (but not too tangy), nice airy inside, and a beautiful loaf to boot. Great recipe and instructions!